Old, dense and isolated clusters of stars might be the perfect place to find intelligent life beyond Earth, say scientists who presented a study about how so-called "globular clusters" may be a cradle of life for advanced civilizations. "If they house planets, globular clusters provide ideal environments for advanced civilizations that can survive over long times," astronomer Rosanne Di Stefano, with the Harvard-Smithsonian Center for Astrophysics, said in a summary of a paper to be presented at the American Astronomical Society meeting in Kissimmee, Florida, this week. 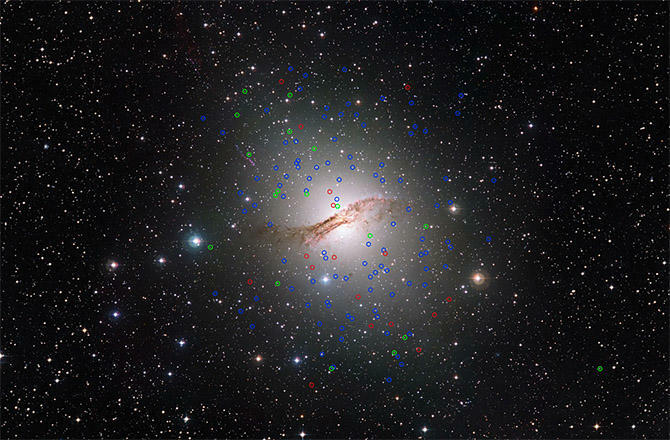 "If planets are found and if our arguments are correct, searches for intelligent life are most likely to succeed when directed toward globular clusters," Di Stefano wrote. Globular star clusters surrounding the Centaurus A galaxy. Globular clusters typically contain about 1 million stars in a region just 100 light-years across. The Milky Way galaxy has about 150 globular clusters, most located in the galaxy's outer regions. So far, only one planet has been found in a globular cluster, but Di Stefano discounts critics who say clusters, which are populated by old, metal-poor stars, are poor hosts for planets. Exoplanets have been found stars with only one-tenth of the heavy elements that are found in the sun, Di Stefano said. Could Alien Life Spread 'Like a Virus' to the Stars? "It's premature to say there are no planets in globular clusters," Alak Ray, with the Tata Institute of Fundamental Research in Mumbai, said in a press release. If habitable planets can form in globular clusters and survive for billions of years, life would have ample time to become increasingly complex, and even potentially develop intelligence, the scientists said. Global cluster civilizations also may be able to communicate with one another far easier than what Earthlings may be able to manage, as the nearest star to our solar system is four light years away, roughly 24 trillion miles. "In contrast, the nearest star within a globular cluster could be about 20 times closer -- just 1 trillion miles away. This would make interstellar communication and exploration significantly easier," the Harvard-Smithsonian Center for Astrophysics wrote in a press release in advance of Di Stefano's presentation on Wednesday. "We call it the 'globular cluster opportunity,' " Di Stefano said in the press release. "Sending a broadcast between the stars wouldn't take any longer than a letter from the U.S. to Europe in the 18th century."